Fancy Forest was so much fun that we are offering another Quilt Club with tips and tricks on a fantastic Elizabeth Hartman pattern! 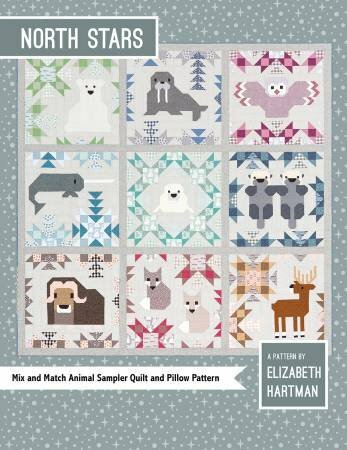 The North Stars animal sampler quilt features nine 24" animal blocks sewn with simple straight and diagonal seams. No templates or paper piecing! The blocks can be mixed and matched to make endless combinations of quilt and pillow projects. Pattern includes instructions for making 24" quilted pillow covers, 54" x 54" small quilts, and 82" x 82" large quilts. Join us the 1st Monday of the month for this crazy fun, 9 month, quilt club! During each meeting we share our completed blocks and give lots of tips and tricks for completing the next block. We are offering 2 meeting times, 9:30am and 7pm. Choose the time that meets your needs each of the 9 months. **In September we will reschedule our meeting due to the Labor Day holiday. *Pattern and Kit purchases additional. Each animal will be kitted separately. Pattern and Kit purchases additional. Each animal will be kitted separately.